I originally started a website in 2009 to make it easy and fun to learn about my Westies. I have raised a small number of purebred puppies for over 30 years, variety has grown as my human family has also grown. We are all different! The farm here in Brighton Illinois is a dream come true. It really is a labor of love for all the furry and feathered friends we care for. I had been an EMT-P, and an RN before turning my calling into a full time way of life. Many wonderful people have joined me in the dedication of adding joy to others lives as well. 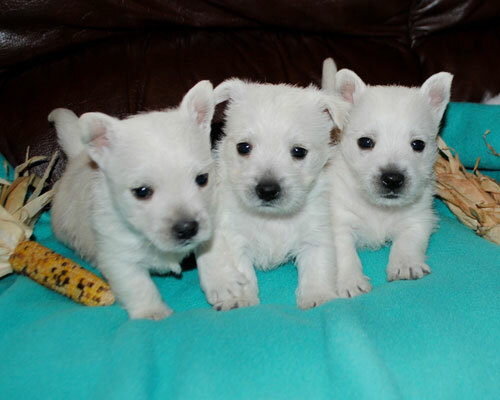 I have raised AKC Westies for over 25 years. The history of how each new breed came to be loved and share our families home is on each breeds parent page. We love each one and the variety! Dogs available on the rescue page, many with such sad past lives. Lets get them a forever great home together! Please consider a rescued adult dog before getting a puppy! We love our dogs, rescued critters of many varieties and country life. I raised dogs for over 30 years, Westies for over 25 years. I have 3 grown children, and 2 grandsons I am blessed live only a few miles away. I have a terrific fiancé who also loves the farm and critters. He's also capable of fixing anything he puts his mind too. A handy man is just the best! Plus extended family and friends who visit, move in and stay, or live here as a temporary home as they each build their own dream.​ We are blessed to be a part of it all. Over time I have added pages and updated the farm name from Laurel's West Highland White Terriers to DreamCatcher Hill, as our furry family has grown to include our rescued dogs, horses, Art's adorable loving Cavaliers, soft furry poodles for designer crosses, the super-wrinkly, smart Shar Pei crosses, and ever silly happy Frenchies. My Uncle AL who moved here in 2013 added Pugs! I can now understand how people call them the clowns of the dog world. In 2016 my aging mother and aunt also moved here full time. We completed their own little house here on the farm in fall of 2017. Fortunately we were even able to make room for my cousin, Brenda, who moved here May 2016. She has been a huge help, not sure what I would do without her! Unfortunately I had to figure out what I would do without her as she has gone back to her ex-husband up north 6 months later. Aryne, a young mom with 3 little boys, we met in December 2016 moved in April 2017. She needed a place and we needed help with paperwork and getting the house for my mom and aunt completed. She has her own place now but is here or at Keith's most of the time. She's a huge help! We mostly only dog-sit puppies and dogs who were adopted from us. When we have dog guests they are in the house with us, and walked on a leash when outside. Dogs will usually be crated when we are outside, and at night. If they are very well behaved they have the run of the house 24/7 with our house dogs. They can even sleep with us if that is what they are use to at their home. If you know of a reputable shipper please email me and I will add them to the website. Trish Klotz 217-690-1000 does door to door ground transport. Shipping by air includes health certificate, crate, and everything needed to fly for a puppy or very small dog. Occasional transport available if purchased from us. Contact us for details. We feed Fromm Lamb and Lentil to our pregnant moms in the last 1 to 2 weeks of pregnancy, and moms with puppies. We usually feed Fromm Surf and Turf to the puppies who we have retained, to any of our potential moms, or bred moms and stud dogs. Some of the stud dogs, rescued dogs, and anyone who is on just maintenance, or spayed/neutered we feed Fromm Classic, or Fromm Heartland Gold Adult. We often add some of the other kibble to their food for variety. There are other Fromm foods that are great, we just have not used all of them. Fromm Beef Frittata, and Heartland Gold adult have made our rotation. We have tried many, many dry foods over the years. Many are great for a few months or a couple years, and then we see strange things happening in the dogs. Eventually it dawned on me that any food can not be perfect, advertised as: "for the life of your dog" really is not a good idea unless you add variety with scraps, or toppers. Seriously, how can any man made food be perfect? People don't know everything, new nutrients and needs for those nutrients are discovered all the time. The healthiest dogs are those who get lots of exercise, and a variety of real foods. Look at the label of what you eat, and what is in most dog foods. Both can be scary. Wetting any dry dog food and letting it absorb the water, before giving it to them is said to help the dog digest any dry kibble better. We would have hard time doing that as we like to full feed our dogs and puppies. We cant afford to throw away and waste wet food not eaten. We do wet puppies foods when they are very young. Since any dog can eat a different amount on any given day we rarely measure their food making them eat one amount each day. The English bulldogs we purchased as adults only one is on measured feed. More exercise is working for every other dog, despite the fact they are said to "require" food limitations for weight control. Since she was a child she trained our dogs, and the crazy horses we would bring home. She has more patience and more persistence then any person I have ever met. Absolutely perfect for training! Plus she loves animals and its all done with love and their best interest at heart. Now that she has time she is going to train a limited number of horses in the basics of eventing for her instructor who has retired race horses. The horses can be hot headed, and are always a very sensitive lot. The horses just bloom under her riding! We have had families getting our puppies ask if we can start housebreaking for them, or trained puppies. We just did not have the time to offer that service. Kim has agreed to board and train any puppies/dogs from our kennel for clients who would like that service. Puppies will be well socialized with children, other dogs, and cats. In addition they will be housebroken (or well started depending on age and how long the puppy is in training) taught to walk on a leash, crate trained, and learn "sit." $125, first week and $95. for each additional week, a fraction of what trainers, or boarding usually is. She may be willing to board and train other puppies, but will have some age, and vaccinations requirements. Price may also be different. Older puppies and dogs are much harder to re-train then puppies are to start correctly. Plus since she has children, dogs, and cats she will not put any of them at risk if an older puppy, or dog is having aggression issues. ALL aggression issues are a direct result of a puppy, or dog not having the right guidance. Personalities are different, but respect for people is training. Please feel free to email me any trainers who you have used and have done a great job. Ashley Edwards is a certified Canine and Equine massage therapist. It is wonderful for dogs in sports, and dogs recovering from injuries, or older dogs who are just stiff a sore. You should see them melt under her hands!